Article first published as Grilled Skewered Lamb Kabobs on Blogcritics. My friend Howard brought these amazing kabobs to our kabob party. The lamb marinated overnight in a mixture of olive oil, lemon juice, yogurt, cilantro, mint and curry powder. I suppose you could marinate it for a shorter period of time but I think the time allows the lamb to tenderize and absorb all the flavors perfectly. Once they're grilled, don't dig in quite yet. To complete the dish, serve it with the herbed yogurt which gives the kabobs a nice cool and creamy contrast! Whisk all ingredients except the lamb and salt in a small bowl until marinade is combined. Place lamb cubes in a zipper lock bag or in a shallow, nonreactive pan. Pour yogurt marinade over lamb and seal or cover. Chill bag or bowl in refrigerator at least 8 hours or overnight to marinate the lamb. Heat grill. Remove lamb from bag or pan and sprinkle with salt. Threat 1/6 of the lamb cubes on each skewer* to yield 6 skewers. Place skewers on the hot grill rack. Cover and cook over medium hot fire, turning once, until medium rare, about 7-8 minutes. Serve with herbed yogurt below. Combine all ingredients in a small bowl and serve with grilled lamb. Delicious looking kabob! It's make me hungry! I can't wait to eat this :) thanks a lot for sharing. 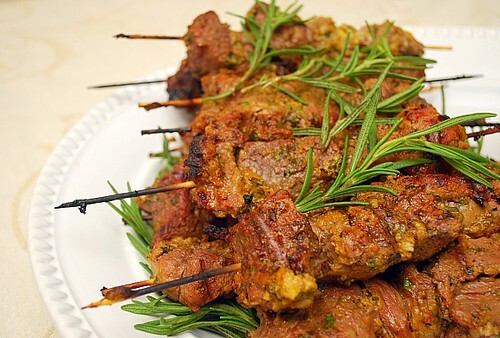 wow,,,these lamb kebab look delish,lamb is my favorite meat,i'm sure taste great YUM.